Modernity looks back upon Greece and Rome as the primal references for its political culture. They were the first class societies in the modern sense, characterized by the rise of the State and of commerce—to the detriment of pre-political forms that were still based on religion, where political power and the priesthood were closely linked. It is on the basis of these two fundamental characteristics that the rise and development of democratic political forms in Athenian Greece and the Roman Republic can be explained. If the supporters of modern democracy have refreshed themselves from these two springs, they have done so without critically examining their socio-historical roots, despite the fact that the latter have been understood since antiquity. As we shall see below, the reason for this is obvious. Without an understanding of these socio-historical roots it is not possible to grasp precisely the immanent limits of democratic forms which, from an abstract form in principle, have led to the modern formulation of the concept of anarchy as the dissolution or suppression of political power. Following the historian Arthur Rosenberg, we could say that democracy “in itself”, as an abstract form, does not exist. It always assumes the form of a particular socio-political movement, with a corresponding class composition. But even this is not completely correct. In my opinion there is indeed a generic relation between the democratic political form “in itself” and society’s class composition, beyond the variations of the political composition due to class struggles and the impetus of social development, and even beyond variations in the forms of production. This is essentially due to the fact that the social basis and prototype of democratic forms is commodity exchange, which has been historically developed by way of diverse forms of production. By making this claim I do not intend to overlook or disregard the major differences between political regimes or, to put it another way, the major differences with regard to the degree of effective democracy that can be realized on the basis of particular forms of production. The idea of political equality, which is the functional basis of democracy, is thus historically derived from the praxis of civil equality. But it is derived from a civil equality within class societies, in which such an equality only exists empirically on the basis of property. And property is the origin of law, and particularly of the status of the citizenry. Equal rights, consequently, although only existing as a formal reality, develops on the basis of a society of owners who freely carry out their economic activity, and whose products are exchanged as a function of value. In political regimes this social composition and its degree of development are expressed in the distribution of power. A distribution in proportion to economic wealth represents the interests of the big property-owners. An egalitarian distribution represents the general interests of the smaller property-owners and traders and, up to a certain point, of the proletariat. The military defeat of Athens by Sparta in the Peloponnesian War meant that the Athenian democratic regime was discredited and the Spartan oligarchy enjoyed greater prestige. For Plato, this was combined with the fact that it was the Athenian regime that had condemned his teacher Socrates to death. Thus, first Plato, and then to a lesser extent his disciple Aristotle, adopted a critical attitude towards democracy, favoring an aristocratic form of government and a more restricted democracy that would overcome the problem of demagogy, respectively. For Plato, democracy was a degenerate form of the Republican form of government. For Aristotle, democracy was a good form of government, but one that had to be protected from demagogy by aristocratic formulas. The Roman historian Polybius called this degenerated form of democracy “ochlocracy”. The annalists and thinkers like Plato and Aristotle insisted upon contrasting the most centralized political forms with the most decentralized forms, where the distribution of power is more egalitarian. This even applies to the case of democracy, as can be seen in the passage quoted above. This is a result, as we shall see below, of the fact that democracy originally had a very restricted meaning, which has slipped into the background in our time. In my view, this kind of position reflected the growth of ideological mystification with respect to the historical process involving the increasing autonomy of political power separate from the social mass that went hand in hand with the expansion and concentration of accumulated mercantile wealth. For a class regime, it is logical that anything that destroys its very constitution would be considered to be degeneration. Thus, in Plato, Aristotle or Polybius, degeneration is also discussed in the opposite sense. That is, not with reference to a relative regression of the centralization of political power, in favor of the masses, but rather with reference to an excess of centralization, or an arbitrary shift in the distribution of power within the ruling class, one that could very well imply a distribution of power that does not correspond with the distribution of wealth (the degeneration of monarchy into tyranny, or aristocracy into oligarchy). It seems obvious that these ideological views from antiquity play a significant role in the configuration of modern democracy. Thus, the modern model of representative democracy was originally inspired by the limited forms whose theoretical dimension was based on Aristotle and whose example had much more to do with the Roman Republic than with Athenian democracy. A partial exception that went beyond this concept, the French Revolution, was inspired more by the Athenian ideal. But by adopting in practice a representative form that contradicted that ideal, it created favorable conditions for the counterrevolutionary reversal of Thermidor. The French Revolution was therefore the practical manifestation on a grand scale of the fundamental contradiction of modern democracy, between the sovereignty of the citizenry and the representative system. As is also true of capital, however, this contradiction is inherent to and functional for the modern democratic system, it is its source of vitality and, as long as one operates within its categories, it cannot be transcended. The political milestone of the French Revolution boils down to the fact that it nonetheless presupposed the establishment of Athenian democracy as an ideal model, as the most coherent formulation of the democratic regime. With the development of capitalism, and the regulation of the latter by means of an institutionally moderated class struggle, democracy would be provided with a relatively stable and coherent socio-economic and cultural basis, which assumed the representative form was an unavoidable necessity; it was a simple matter to use the Athenian example to legitimate and perfect the modern, Roman-style democracies. Modern democracy thus became a form of government specially adapted to the contemporary class struggle, while its own effective foundation—the freedom of property and exchange—was progressively eliminated by the historical development of the concentration and centralization of capital. Now we shall take a closer look at the deeper meaning of the polemics of antiquity, which requires that we first study the etymology of democracy and ochlocracy. The famous prefix “demo” of the word democracy (1) did not originally mean, and did not figure in the practice of Greek democracy in this sense, “the people”, as it is often interpreted today. The “demos” was a small-scale territorial political form, similar to the commune. It is true that it presupposed an assembly (the agora) in which the citizenry directly participated; but the majority of the population—women, slaves, metics (foreign merchants and craftsmen), debtors of the city and those whose rights had been revoked, and of course children—were practically excluded from the enjoyment of the rights of citizenship. This may seem merely anecdotal if Greek society is viewed from the perspective of its formal similarities with its modern counterpart so as to emphasize its functional virtues. From the historical materialist point of view, however, we must acknowledge the fact that the economic foundation characteristic of Hellenistic and Roman grandeur was composed of slavery and war. It was this foundation that made Athenian democracy possible. This is why I do not think it was by chance that direct citizens’ democracy grew in tandem with the expansion of slavery. I think this can be understood as a form of class collaboration, with imperialist expansion as an additional source of wealth, which would obviously have the effect of reducing the friction between the various layers or classes of Athenian democracy. This also allows us to trace the outlines of another kind of parallel with modern democracy. From the formal point of view, what stands out is the fact that the individual is only recognized politically as a citizen. Thus, his participation is a vehicle for the ruling interests in the polis. By way of the category of citizenship, the individual was subjected to an institutional system and a constitution that were functions of a particular form of the distribution of wealth. The individual as such was only a political subject under these conditions, as is also the case in today’s democracies. Immigrants, for example, did not have the status of citizens and were therefore not political subjects. The word ochlocracy (2) is derived from “ochlos”, which means crowd or mass of people. That is, it conveys the sense, as is evident in Polybius, of the assumption of power by the masses as a whole, or of the conversion of the disorganized masses into an effective political power. This is why the intellectuals of the ruling class mystify the term ochlocracy, defining it as the result of demagogic influence over the masses and politically proscribing it, with the argument that the pressure of the masses distorted true or ideal democracy, so that the “general will” was destroyed by the particular wills imposed from below. 2) masses that are manipulated, that exercise their power on behalf of a minority, do not themselves exercise power. In the second case, what we have is a veiled form of tyranny. For the purposes of the democrats, however, who represent class society, the tyranny of the “uneducated” majority and the tyranny of an educated minority are the same, because both abolish their allocation of political power. Thus, from the democratic point of view in the strictest sense of the term, and if we want to speak accurately, all mass revolutionary processes in their political dimension constitute a form of ochlocracy. If this concept is so unknown or sounds so strange today, this should not cause us to reject its use but to discover to what extent we are ourselves still completely immersed in class culture and particularly bourgeois class culture. The Roman political regime also presents etymological parallels with the Greek case. 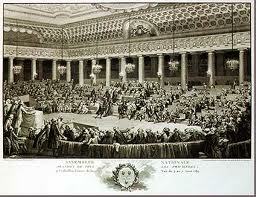 The plebs was distinguished from the people (populus), with regard to the rights of citizenship as well. The term that can be translated as rabble (vulgus) was also used, which meant common people, to refer to the plebs. Plebs therefore has the same meaning as the Greek ochlos: the masses in general, disorganized, lacking rights or outside the system of the ruling hierarchy. The context of the struggle between plebians and patricians in Rome was also that of an expanding slave society. The plebians comprised a heterogeneous class, since, although it was initially defined by its difference from the patricians, it included both landowners (adsidui) as well as the landless (proletarii), among those who were free men. Their struggle for equal rights was therefore a mixture of interests and this category cannot be defined as a social class determined by landownership or propertylessness, but by antiquated political rights which entered into conflict with the new mercantilist economic base. The patricians, as the name indicates, were defined by their membership in large family units under a pater familiae, who initially possessed enormous power. These family units were based upon a common and inalienable patrimony of land (terra patria) and slaves. They thus constituted a concentrated economic and political power, which governed the whole society through its representatives. At first, plebians were exempt from military service and taxation. But this changed with Roman territorial expansion, which obliged the State to resort to the plebians for revenue and soldiers. The plebians began to fight for their rights, thereby threatening the Republic’s defensive capabilities. As a result, first civil equality was obtained, then political equality. This led to the basic formulation of Roman law, which was previously limited to the customary interpretations of the patricians, and the official institution of the tribunate as a form of egalitarian representation for the plebs. With the passage of time, however, as the wealthy plebians participated in the military assembly, this favored the formation of a patrician-plebian aristocracy (nobilitas) set against the urban proletariat, because service in political office was not remunerated. Political rule thus remained, even during times of instability, in the hands of the wealthy class. But before we continue to examine the problem of political forms, we must pause for another etymological investigation. According to Mariano Grondona (4) there are two concepts of power among the Greeks. The first is arkhein, which means to “initiate” and to “dispatch”—whence are derived arkhé (origin) and arkhos (chief). Thus, the original power is that of the chief, which leads Grondona to posit a despotic genesis of power. On the other hand, the actual word power is derived from the Indo-European poti (chief), whence the Greek posis (husband) and despotes (owner) are derived. According to Grondona, it was from this original meaning that the meaning of the word power was extended to signify “the generic capacity for doing something”. This etymological origin in arkhein thus assumes archaic forms of society, where power is transmitted from chief to chief in obedience to an ancestral custom or tradition. This characteristic, and not its alleged character as “despotic command” as Grondona argues, is in my opinion what explains the fact that concepts like “monarchy” (the power of one) or “oligarchy” (the power of a few) have retained the root word arkhos (chief), while in other concepts the latter was replaced by kratos, which means a power that is voluntarily established—which is also translated as “government”. We thus arrive at the other part of the word democracy. The latter should therefore be translated, literally, as “government by the demos” or more generally “government by the citizenry”. But the most important thing is that, as we have seen, the original meaning of democracy refers to a type of political system in which power is separated from its traditional bonds to custom, religion, etc. The concept of democracy therefore had nothing to do with that of “sovereignty”—a power that is “above all” the others. The idea of sovereignty thus arose in order to express “the opposition of State power to the other powers” and attained maturity with the process of the centralization of political power that led us to the modern era. (5) It was not by chance that this process was driven forward by the primitive accumulation of capital, which was so carefully examined by Marx. This is why the bourgeois idea of sovereignty refers to the State, postulating the citizenry as sovereign only through the State. The “people” is sovereign only insofar as it constitutes the State and by means of the latter, even though, in theory, the former is the source of political power and, on the other hand, the established power is supposed to be its emanation or the alienation of the immanent power of the “people” (Rousseau). Bourgeois political theories thus came to justify the subordination of centralized state power, formed under the old regime, to the new rising class, the bourgeoisie, which also needed the support of the popular masses to rise to power (and therefore needed the support of democracy). Sovereignty as the effective power of the people is a different concept, which is clearly connected with the struggles directed against bourgeois state power. As we have seen, however, the use of the concept of sovereignty to refer to the power of the masses in general is inadequate, since it is still inscribed within the limits of democracy. We shall now continue with our etymological investigation. The development towards democracy, in the Athenian case, began according to Grondona with the emergence of a distinction between natural laws and the laws of the city (nomos). This means that power was no longer only commanded, but also legislated. This assumes the government is based on norms that can be changed at will and, at the same time, are inscribed in a definite framework: the politeia. The possibility thus arises that the subject of this political will can also be voluntarily determined. This created the context appropriate for the formation of the deme or demos, those constituencies where individuals resided, which thus became polites (political). In another vein, I cannot agree with Grondona when he interprets the evolution of the notion of “power” so that it means “the generic capacity for doing something”. From what we discussed above it follows that traditional power or arkhos, and institutional power or kratos, have quite specific denotations. As for poti, the source of the Latin word potere, it connotes the sense of possession which is accentuated in the Greek posis and, at the same time, also in the sense of command in despotes, which is similar to the Greek kratos. But all these terms equally share the reference to social or collective forms of power, so that they do not just define power as an individual generic capacity. This underlying duality can be explained by the development of the alienation of social power from individual power, between the political organization of society and the capacity of the individual for action, which is manifested by way of group struggles and yields to distinct forms of government. We can understand this problem better through a consideration of the case of Rome. The word designating the capacity of the individual for action in Latin was virtus and in Greek andreia—whose meaning was identical. (6) Both derived from an Indo-European root word (vir/aner) that means man (the masculine) and which was also the source for the word virile. (7) There is, however, a similar Indo-European root word, vis, which means force. Which is why it can be said that in antiquity these root words vir and vis were indistinguishable. Vis means vital force, which includes violence. Thus, both root words appear to be complementary and allow us to arrive at a basic shared meaning: man defined by his immanent force, which is externalized by his vital activity in society. This basic shared meaning is also shown by its evolution into virtus, vita (life) or vitium (defect or vice). Virtus, for its part, is composed of the suffix -tut, which means condition or quality. But virtus does not refer to an external condition or quality, but to an internal one. In this respect one can clearly discern its relation to life or vital force. But this is even more explicit in its primary Latin meaning, worth or courage. What is of interest here is that the term virtus underwent a complex evolution until it came to possess the full meaning of the word virtue. By this I mean to say that this evolution had to result from complex socio-historical transformations (among which, as late as the modern era, we must include the general tendency towards the abstraction of the human and the latter’s subordination to technics, which is quite visible in the term’s current state of disuse, or in its use as an adjective—“virtuoso”—to refer to particular technical abilities). In Roman society, where the basic values were masculinity, militarism and morality, the concept of virtus was practically indispensable in judging individual behavior. Thus, Lucilius said that: “Virtus . . . is to be able to pay in full a true price for things in which we participate, and in which we live . . . it is to know what is right, what is useful, and what is honorable for a man, what is good and likewise, what is bad, what is useless, shameful . . . to put the interest of fatherland first, of parents next, and third and last, our own.” (Lucilius, Satires. See: Myles Anthony McDonnell, Roman Manliness: Virtus and the Roman Republic, Cambridge University Press, New York, 2006, pp. 124-125.) Unlike the Greeks, the Romans had a pragmatic mentality, which implicitly presupposed an emphasis on virtus as a practical quality, distinct from mere intellectual knowledge, whose separation from practice they considered to be one of the defects of the Greeks. Thus the idea of the virtutes came to include all the “good qualities”. Virtus was associated with a worldly or divine reward, especially with military glory, which was also understood as something hereditary, for which reason one had to compete in order to equal or surpass the virtus of one’s predecessors. This also posed the problem, however, of competition for worldly glory in the form of dignitas—political power and wealth. Particular interests were opposed to general interests, which is why Cicero proclaimed that politics should be understood as a way of life and conduct. At the same time, socio-historical conditions caused virtus to be an ideal that was initially linked to nobilitas. But with the expansion of the Republic, the ostentatious wealth of that upper class produced a generalized deviation of the concept’s meaning, which was detached from the traditions of the forefathers in order to establish the social ethos as its true axis. With this development the individual’s capabilities and conduct were emphasized as the roots of virtus. In this way, these two factors, political and economic respectively, determined the promotion of virtus to an ethical quality which, as an individual responsibility, was simultaneously objectively social and allowed one to refer individual actions to the collective interest. We thus arrive at a definition of the Roman ideal of the social individual. As a preliminary conclusion to our etymological and historical study, I believe that the generalization of the concept of power as the “generic capacity to do something” can be explained by a phenomenon of alienating transposition, in which one term becomes assimilated to its opposite. But since nothing, alienation included, is absolute, the concept of virtue has not been completely assimilated to that of power. Power always retains the meaning of an instrumental capacity, while virtue retains the meaning of a vital or immanent capacity. “To live well” is virtuous. “To do something well” refers us to a mode of technical activity, to the manipulation of objects. Even when we say, “I can move”, we are unconsciously referring to our bodies as objects, upon which we can exercise our will power, which is in this instance conceived as an autonomized force of the body or imagined as external to its organic function. The separation between potere and virtus, considering the alienation of the latter in the former, must therefore be considered as the symbolic expression of a particular socio-historical reality, not as an accidental contrast or superimposition. Linguistic differences are always cognitive representations of practical differences, and the preservation of terms whose meaning has been assimilated by without being completely identified with other terms (thus becoming partial synonyms) presupposes that said practical differentiations have an enduring and antagonistic socio-historical basis. What I said above is not meant to bypass the problem of everyday usage, which also has a practical basis in today’s society. In my view the key is to reclaim the concept of virtue and reinvest it with its full meaning, in order to provide a foundation and complement for power as the instrumental capacity for action. When it opposes established power, virtue is the self-power of the individual in the face of the autonomized power of institutions. Thus, if in the concept of ochlocracy we discover the arkhé (the beginning or original source) of collective self-power, in the concept of virtus we discover the arkhé of individual self-power. The complementary and harmonious development of ochlocracy and virtus would only be possible if there were to be no distinction between community power and government power, or between everyday life and political life. It would mean, in short, the achievement of anarchy, for which we are now capable of providing a more profound definition: the suppression of all forms of autonomized power that opposes individuals, whether of law or tradition, and their replacement with a new form of power that, as the term itself says, “lacks a beginning” or “lacks command”, because its source is timeless and immanent to human beings. This power is the direct expression of their humanity via cooperation. But anarchy as a political regime requires a humanity that has developed the quality of self-government: its social virtue. This characteristic only started to become a concrete possibility for humanity thanks to the development of psychological and social self-consciousness on the one hand, and the development of human cooperation towards increasingly complex forms, on the other. We may also note the contrast between power and virtue on the psychological plane. Virtue, meanwhile, is the use of vital force in order to do something that corresponds to our nature, which means self-realization—the fullness, the good and the beautiful for humans. It therefore presupposes a psychological and psychosomatic integration in general, and an overcoming of the ego’s autonomization in particular. To the extent that this is achieved, the interior state ceases to shift between continuous conflicts and the self-organizational capacity immanent to the psyche, it becomes conscious, it allows a self-determination without all the mechanical mediations that characterize the ego, but without leading to a blind, spontaneous mode of activity. As I have said, however, the historical preconditions for anarchy are not yet fully developed. They must nonetheless be fully developed on the basis of, and in a radical and integral break with, life today in its entirety. This is why the above reflections do not imply that an immediate supersession of democracy is possible, which leads us to the problem of transitional political forms. 3. The “crowd” organized in this manner permanently holds real power, so that it makes no sense to speak of “ochlocracy” as a distortion of the popular will: the only distortions that it harbors are the incongruous decisions of the popular masses themselves. The problem of demagogy is replaced by the problem of collective intelligence. Focusing on the concept of ochlocracy is of particular interest today because, in the search for new concepts to describe political forms, such terms as “holocracy”, “plurarchy”, and “demarchy” have arisen . . . Holocracy is a term used to describe a world government as a solution for all the problems afflicting today’s society. It is not necessary to point out that, with regard to its real effects, holocracy would essentially change nothing in social relations, and by itself is not a necessary factor for bringing about such change. Plurarchy is defined as a system in which decision-making is not binary (yes/no); those who support one side or another may act on their own account without external sanction and the common will is established only by consensus. The first aspect does not necessarily conflict with either democracy or ochlocracy. But the second aspect, in reality, poses a risk, because it assumes that the will of the various factions cannot be limited by the will of all, which is a projection of bourgeois individualism. The factions can only exist as formations of the whole, although the latter does not present itself in that way in the stage of the constituent emergence of movements or communities, when it divides from the dispersion. Even so, these factions are emanations of the social whole and can only emerge simultaneously thanks the relative homogeneity of the whole. Demarchy is an intermediate concept between democracy and ochlocracy. It means that the organized people is the basis of political power, that the people is the “beginning” of that power, but in this sense it is only another form of direct democracy and preserves the formal characteristics of democracy. By way of conclusion, we may say that democracy exists wherever it is not the community which directly self-organizes it, but where a formal structure exists which mediates the effective constitution of the social community as political community and conditions it. This occurs in all permanent organizations, which presuppose a structure, rules, program, habits, etc. At the same time, these organizations, within capitalism, presuppose the general separation between political power and everyday life, units of life and organizational units of power—one cannot leap over the global structure of capitalist society. Participation in them and therefore the power of the individuals who are its members, is delimited by adherence to these patterns and divisions. The external individuals have no direct power over these stable organizations. For these three reasons, permanent proletarian organizations within capitalism are always democratic in form, in the strict sense that we have outlined above. The ochlocracy of the proletariat can only arise as the political expression of the revolutionary process in such a way that it will be the appropriate name for the unlimited democracy that the radical revolutionaries want as the form of the revolutionary power of the masses, and whose structure in the past was exemplified by the model of the soviet or council system. Acracy would be one more step forward, since it presupposes the complete disappearance of political power with the suppression of the remnants of inequality produced by class society, together with their corresponding forms of subjectivity. Recent discussions concerning political forms have shifted towards more concrete forms. For example, the concept of “distributive networks” has been proposed in opposition to the typical concept of networks as decentralized entities, but in which in practice some nodes are dominant or central. All decentralization is always relative and, therefore, the key question is never formal decentralization, but effective decentralization. Real decentralization of power must mean that power is “distributed”, in our case equally, among the nodes (which in the cyberpunk movement are the individuals themselves; the blogger movement on the internet, for example). Direct democracy always implies formal decentralization, of course, but it usually does not address the problem of effective decentralization. In this context what we mean by formal decentralization is the decentralization of decision-making. The effective participation of individuals in the preparation, development and implementation of the political will remains on a secondary plane, as a derivative rather than an organic element. There is no effective connection between decision and implementation, because the decision-making body is not identical with the executive body. The individual who has the right to participate in decision-making does not thereby also acquire the duty to implement the decisions. In this way, in a few words, it is taken for granted that direct democracy in the decision-making process is equivalent to the establishment of a regime of freedom. The content is assimilated to the form. The political form we need must start from a totally different approach. What in the political form does not have to be organic, what has to be instrumental, is not effective participation, considered in its quantity and quality (space) as well as in continuity and endurance (time). The instrumental (10) must be the purely political moment, deliberation and decision-making, with its modalities. One thing is that this moment has to adopt a form that corresponds to the kind of participation that is sought. This is obvious: means and ends have to be coordinated. But it is entirely another matter to think that the form of decision-making can produce, in itself, a corresponding type of participation. It is a purely practical matter: most collective activity does not consist in decision-making, but in preparing for decision-making or implementing the decisions, which is why the dynamic of execution is what determines the dynamic of collective life. In this sense, the very concept of democracy is insufficient, however it is qualified. Instead, the concept of ochlocracy fills the breach completely. Because it refers to the fact that the political subject is not a formal structure (demos) or a mass of individuals connected to that structure: it is the collectivity as such, for itself. That is, ochlocracy implies a type of participation that is not determined—or, is neither driven by nor limited—by a formal structure or by an individual connection with such a structure, but by subjectivity itself and the form of activity that characterizes the masses. In other words, it is a mass of people that consciously transforms its individual self-powers into a social power, which permanently acts as both constituent and institutional power at the same time. Without this vital premise, ochlocracy is impossible, but so is what is commonly called direct workers democracy, since then the latter would be vacated of the participation or the content that it needs to be a living form (or else that participation or content will simply not last). Only the privilege of the decision-making and deliberative moments, by granting them permanent forms (assemblies, etc. ), allows the preservation of the illusion that direct democracy can possess some value in itself, or that it can exist at the margins of the effective and concrete participation of individuals. We now enter the more functional concrete plane. That the decisions are made following procedures that are crafted to conform to a compensated collective will—or put another way, procedures designed to avoid attacking or scorning the freedom of minorities, but which do not elevate them above the majorities, either—is not the most important issue. What matters is that decisions are made through the conscious participation of all the individuals involved in their preparation and implementation. On this plane, democracy only has to exist as a procedural form, not as a rigid institutional system. The error of the traditional anarchist view is its fixation above all on the form of the procedure and its losing sight of what we discussed above: the problem of effective participation. In practice, the subordination of majorities to consensus with minorities is no less authoritarian than majority decision. The “voluntary” submission to consensus does not abolish authoritarianism, but internalizes it. In this way a reification of the collective power is created in the form of a dominant abstract entity—the assembly as political community. Each individual or group is obliged to submit to this institution if it wants to continue to participate in the real community. As a result, they do not possess real autonomy, but an autonomy that is alienated and crystallized as the property of the assembly as a formal structure. It is the presence of rigidities of this kind that has made democracy, even direct democracy, a political system. Therefore, we must reduce them as much as possible, as insurrectionalist anarchism has correctly advocated—which is a step in the right direction, although I think that its solutions are inadequate. The solution to the problem of bureaucracy is not to turn the committees into structures subordinated to the assemblies. The solution is to create, following the approach of Marx and Engels, conditions where the committees cannot become autonomous, (11) for the purposes of which the formal convoking of assemblies is insufficient—even if they are convened on their own impulse. Similarly, the solution to the problem of authoritarianism is not to prevent one person from imposing his will upon another. The solution is to bring about conditions where anyone can fight effectively against the authority that he or she rejects. Since the problem of authoritarianism is rooted in the direct relations between individuals, it cannot be overcome by way of “anti-authoritarian” rules, which do not go to the root, but only ameliorate the problem. And as I have explained above, by themselves formal measures favor a mystifying democratic formalism, which becomes an obstacle to the understanding of the problem of the development of individual autonomy and its indispensability for the full development of collective autonomy. Democracy reduced to a procedural form, in order to develop a permanent debate and total participation of individuals, besides being for the purpose of deciding their concrete actions, overcomes the formalist rigidity without falling into its opposite—an informalist rigidity—and concentrates its attention on the most important thing: the development of free and equal cooperation and its extension. This means that democracy is no longer stable as such, that it is in the process of transition towards ochlocracy. Perhaps the concept of “demarchy” could be applicable to describe this transitional form, in which democratic forms persist in the matter of procedure, but have become subordinated as an instrumental element to the direct will of the self-aware and self-motivated individuals—“it begins” (arkhé) in them and returns to them—which is the basis of ochlocracy. The ruling class definition of ochlocracy attributes to this term a character that is perverse in itself, while it considers democracy and other forms of government as “pure”. This has resulted in the fact that even today the concept is utilized to criticize, for example, the populist governments in Latin America, especially when they use mass mobilization to their advantage. In some cases the concept is explicitly used, but for the most part the old refrain of demagogy is repeated, which has come to be used as a synonym. The association between demagogy—and more generally the absence of self-aware popular action—and political programs that are supposedly “socialist”-oriented is therefore reinforced: an obviously right wing approach, which is nothing but the obverse of the leftist populism to which it is opposed. The argument’s plausibility is based principally on the image of populist leaders or parties, which, whether or not they use the explicit lie to manipulate the masses, provide plenty of examples of how they accentuate the discretional use of information in order to bring about a reaction on the part of the masses that is favorable for their interests or programs. This is an inherent feature of all populist bourgeois politics—or all bourgeois politics that includes the active search for mass support—and does not especially depend on which party or leaders hold State power. In any case, their political position can either enhance or reduce their propensity to demagogy and their influence over the masses. It so happens that, generally, in capitalist society to speak the truth is not politically profitable. This is not necessarily because there are interests that must be concealed. It is rather because the masses themselves do not want to know the truth. They only endure and accept their alienating existence by clinging to expectations associated with capitalist progress, and their very existence causes them to feel powerless before the general trend of historical development, incapable of establishing another social system. This is why they are predisposed to pay more attention to the discourse that they want to hear than to the one that appeals to and seeks to provide a true explanation of the facts. They prefer the discourse that nourishes their illusions to the one that refutes them. Given this vicious circle, the very existence of the masses is encapsulated in a lie. And it is this lie itself that makes their existence endurable. All the social lies in the era of capitalism are based on the axiom that the social development of commerce, guided correctly, will resolve today’s sufferings and limitations, or at least gradually reduce them. It cannot be denied that this axiom has a very precise subjective foundation, which is the source of the powerful resistance of the masses to all revolutionary discourse or action. It is a form of subjectivity that projects its needs into the appropriation of objects; which is ready to convert its being, its life, into a means for having and therefore it is completely functional for the development of commodity production. This is true even when, to achieve this goal, it finds itself in opposition to the bourgeoisie. In fact, the masses only rebel against capitalism because the latter has disappointed this kind of expectation to what they thought was their due, not because they have overcome their spiritual self-alienation. In other words, it represents the interests of variable capital rather than the interests of the liberation of humanity. If in order to achieve this kind of goal the proletariat constitutes itself as a class, and acts as a class, it nonetheless only attains this objective on the formal level; it does not effectively become a class-for-itself in the Marxian sense, but in fact remains a class-for-capital. And then the class rebellions or struggles are transformed into a spur for the further development or improvement of capitalism. Typical forms of social behavior continue to prevail, which can be simply differentiated by degrees of passivity/activity with relation to capitalist development: some sit back and wait, others put their shoulders to the wheel. But all share the same expectations, they project the same goals into their praxis, which brings some meaning into their miserable lives. More precisely, the belief inherent to the dominant form of subjectivity, according to which the complex psychic dynamic that characterizes human life can be gradually expanded and realized in the future, so that capitalism provides a form of realization for all impulses. But this conformist expectation is not fulfilled. Neither by the development of consumer society, which clashes with the limits of capital, nor by access to a higher level and greater diversity of this consumption. Thus, by definition, the psychic or vital human dynamic can only be satisfactorily realized by way of an unlimited self-activity, through the free unfolding of all its needs and capacities. And this is impossible in today’s society not only because of the limits of capitalist production, but because all material production is economically, technologically and ecologically finite. If this were not enough, it is becoming increasingly obvious that the growth of the level of consumption does not in and of itself contribute to either happiness or the development of the human faculties. This phenomenon has very deep roots. Existence is activity. Human nature is essentially self-directed activity and thus it is only in self-directed activity that one can find self-realization. Possessing, having, is a form of retention or reduction of self-directed activity as such, besides restricting or subordinating self-directed activity in general to this particular modality. This is why it can never produce a happy life or favor the development of the human faculties. To the contrary, it produces a feeling of emptiness and impotence, because possession is an alienated form, instead of being just another function, of self-directed activity as such. One lives to possess, instead of possessing in order to live, and existence is sacrificed to possession. In this way, material production instead of serving to enrich and amplify self-directed activity, life, impoverishes it in alienated consumption as much as in alienated labor. And one cannot just stop doing this, because that form of labor is its effective basis and, in itself, already contains the principle of the subordination of life to possession: in the general form of the subordination of living labor to accumulated labor, and in the particular form of the transformation of the life of the worker into a mere means to earn a wage. On this psycho-social basis, capitalism has come to completely subsume subjectivity as desire and as creation, perfecting the cycle of capital. This achievement completes the subjection of the entire dynamic of society, both in the material and the spiritual senses, as a function of the cycle of capital. Proletarians can no longer live except as elements of this all-embracing process of capital, which includes production, circulation and consumption and reconfigures the fabric of everyday social relations as a functional whole to serve its needs. But let us now return to the problem of populism. It is evident that, upon the above-described social foundation, all populism almost inevitably acquires a certain flavor of the political strongman. This may be more pronounced in some cases than in others. If we consider this from the point of view of classical antiquity, this kind of authoritarian politics based on populist demagogy is, from the perspective of the forms of government or political systems, an activity characteristic of tyranny. (12) In these cases popular support, however active it may be, is instrumental and alienated. It is therefore not a question here of a democracy that has degenerated, but of a democracy that has been violated in such a manner that it has allowed an illegitimate ruling class to obtain power. What is presented to a sector of the ruling class as a degeneration of democracy, is in reality merely a transformation from oligarchy to tyranny. This shows how, in general, bourgeois politics is profoundly demagogic when it refers to history to back up its arguments. The concept of democracy itself is used demagogically: good democracy is always formally constituted in accordance with the class-based structure of society and its development; the democracy that the “mob” believes in is always a perverted democracy. When examples arise showing how this is not necessarily true, where the masses demonstrate a revolutionary self-organizational capacity and are not just conservative, then resort is had to the false identity <popular rule=mob rule>, and to the following syllogism: given A (popular rule is mob rule), and B (mob rule is perverse, irrational, dominated by falsehoods, etc. ), then C (popular rule is perverse—and its origin lies in the power of the people, as is implicit in A). This fulfills a dual function: on the one hand, as an argument of the bourgeois factions against popular rule, but above all as a mystifying argument regarding this capacity of the masses. In the case of Venezuela this can be clearly seen. The faction of the bourgeoisie opposed to Chavism knows perfectly well that the latter’s power depends more on the self-directed activity of the proletarian masses, as limited as this may be, than on the bourgeois sectors that support Chavez. The syllogism referred to above is, however, tremendously “popular”, precisely in the pejorative sense that the classical thinkers conferred upon the “rabble”, the “plebs” or the “mob” as political subjects. The conclusion of the syllogism, “C”, has become a more or less unconscious premise of all variety of prisoners of the democratic-liberal mentality, including many anarchists who criticize these governments for being authoritarian and do not go beyond this. The most important result is that the populist governments are questioned in terms of bourgeois politics, as agents contrary to individual freedom, to legitimate interests, etc. Even when they engage in socialist demagogy, they are condemned for their incoherence, rather than being denounced for their capitalist character from the very beginning. It is not too hard to see that the real question concerns the interests to which populist politics respond, and which normally comprise their consistent contents, despite variations in the concrete governmental policies. This aspect does not interest, of course, bourgeois political forces. Because it brings to the forefront concrete class interests and, where there is a combination of distinct class interests, or even contradictory ones, it logically leads us to evaluate their respective influences on the determination of government policies. On the other hand, these same bourgeois forces are interested in merging the heterogeneous mass mobilization with the autonomous actions of the masses. For if one takes “popular power” for granted, then the latter is only confirmed to the extent that it effectively directs social development and determines concrete governmental policies, which is almost never the case. The right wing forces are very careful to bring this contradiction of populism to the attention of the masses in these terms. But it is otherwise with regard to the left wing of capital, in so far as it participates in the development of populism (for example, many Leninist parties). In this case they cannot attack the mystification of the power of the masses without also attacking their own positions, and this is why any support for populism ultimately leads to capitulation, first programmatically and then theoretically. Unqualified antiauthoritarianism is always based on a fetishism of formal organization, and for this reason shares with populism an abstract view of the activity of the masses. For both, a popular or proletarian action is an action carried out by the masses of the people or of the proletariat. Thus, if this action should result in some form of despotism, this is attributed to the will (conscious or manipulated) of these same masses. For some, this will is directly attributed to the authoritarian mentality of the masses. For others, it is attributed to the influence of the authoritarian mentality of their leaders. From the historical-materialist point of view, however, a popular or proletarian action is one that, besides being carried out by the corresponding subject, tends to lead to the type of social interests that the material organization of society and the overall historical conditions determine for these subjects. In other words, “action by the proletarians” (form) and “action with a proletarian character” (content) are not the same nor do they necessarily imply one another. (14) At the cutting edge of the concrete, the action of the proletarians is only consistent with its socio-historical determinations insofar as it leads to a movement of self-liberation, of disalienation. But where it expresses an acceptance of their existence in self-alienation and only attempts to formally modify it, by the restriction of its struggle, for example, to raising wages or supporting social welfare policies, the proletariat is only acting as a class-for-capital. 8. The idea of self-power (atma-sakti) is taken from the philosophical vocabulary of Aurobindo Ghose. 9. From this point of view, Marx’s thesis that it is not understanding the world that is most important, but changing it (Theses on Feuerbach, 1845), also has a psychological application. If we adhere to our ideas of the world, and the world is becoming, our intellectual attitude will inevitably come into conflict with the goal of changing the world. The correct attitude is therefore that of disinterested attention in order to grasp concrete reality, and then the subordination of our intellectual activity to the general practical goal—without succumbing to a psychic fixation on particular interpretations of this goal, since our intellect is also subject to becoming. It is a matter of living in a state of creative flow, instead of one characterized by ideological security. 10. Please note that here I am speaking of political forms. From the point of view of effective praxis, of concrete human activity, decision-making is not instrumental, but is organically bound to that activity, which is a dynamic unity of being and consciousness. What we are discussing here are the formal guidelines that define the institutional dynamic and its effects. Within the framework of social activity, the atomization of decision-making with a view to practical realization is only possible by way of a division of labor. 13. Others have insisted that the Bolshevik regime was established by means of a coup d’état, rather than as a direct result of mass action or the development of the soviet system. This does not, however, obviate the fact that the Bolshevik regime could count on the broad support of the proletariat during the first few years of its existence. 14. I shall not venture here to comment upon the ambiguity and contradictory nature of the category, “the people”, which is itself one of the ideological mainstays of populism. Roi Ferreiro has also written a useful critique of the ICG's understanding of the 'democratic form' available in the library here that I have commented on previously. (Search just ender Roi Ferreiro as the old link is faulty).